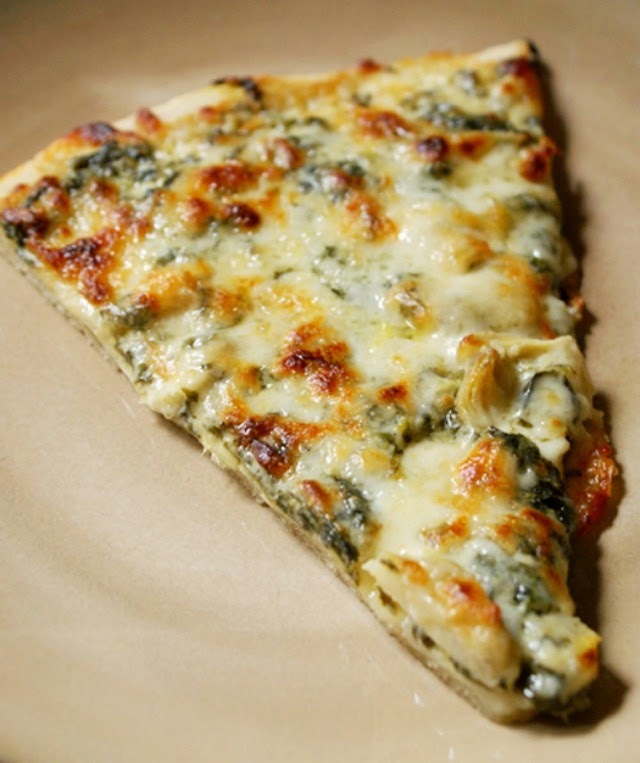 Spinach Artichoke Alfedo Pizza is like your favorite creamy, hot, bubbly spinach dip morphed into a pizza. When I was a kid, Friday nights at my house were a special kind of night. That magical night held the kind of tradition that every kid can only hope for...pizza night! "Paaaar-tay! Pizza paaaar-tay", my three sisters and I would chant as we set the coffee table with plates, napkins and parmesan cheese. It wasn't often that we were allowed to eat dinner at the coffee table, which made pizza night that much more fun and memorable. I've carried on the pizza party tradition with my family (chant and all), although sometimes I opt for homemade pizza as opposed to take out. If I have enough forethought and time on my hands I make my own crust in my bread machine, but the tube stuff works just as well. As far as toppings go, pepperoni is a favorite of ours, but every so often I go all out and dish up this rich, decadent, scrumptious spinach artichoke alfredo number. It is O.M.G. good. Imagine the creamy, hot, bubbling spinach dip that you love to order at your favorite restaurant and morph it into a pizza. It's ingenious, I tell you. Just try it. You'll see! 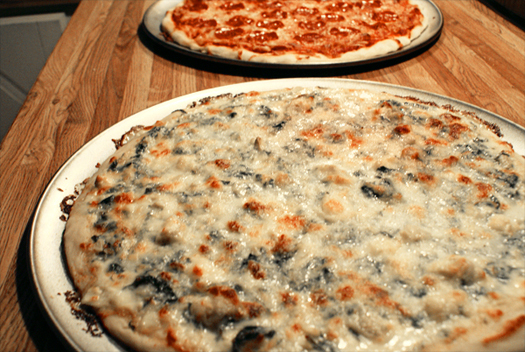 Yield: This recipe makes one pizza heavy on toppings or two pizzas lighter on the toppings, whichever you prefer. Preheat oven to 425° if you're using homemade dough. If you're using the stuff that comes in a tube, follow the cooking instructions on the label. In a medium saucepan over low heat, stir together the cream, butter, and cream cheese until fully melted. Stir in the parmesan cheese and garlic powder. Continue to cook and stir for 15 minutes. Meanwhile, place spinach in a saute pan with a tablespoon of water over medium high heat and saute until wilted. Once spinach is fully wilted, place it onto a clean kitchen towel and wring out all of the liquid by twisting the towel into a ball with the spinach inside. Once you've squeezed out all of the liquid, add it to the sauce. Spread the sauce over the pizza crust. You might have some left over for dipping depending on how saucy you like your pizza. Place artichoke pieces over sauce then top with mozzarella cheese. Bake for 15 minutes or until you start to see the cheese browning. Let sit 5 minutes before slicing. This looks so good! I'm trying it tonight for supper! This was delicious, and I ate the leftovers for 2 days! Thanks! You know a meal was good when you want to eat the leftovers more than once. ;) Glad you liked it. I'm a vegan. This seems a little too fat ladled and artery choking. Do you have a skinny version? I haven't tried lightening up this one. If you do, let me know how it turns out! This was so good! My husband will not eat pizza (or any dinner) that doesn't have meat, so I added 1chicken breast to it. He told me "you better remember what you did". Luck for me, adding chicken was the only thing I changed. I have a bad habit of changing recipes and forgetting what I did. This recipe looked too good to change. I guess I could change the white sauce to make it less "fat ladled" but then there really wouldn't be a point in making the pizza. Hola desde España!! Hoy es viernes y esta misma noche haré esta estupenda pizza para mi marido y para mi!!! Desde que fuimos a NYC en nuestra luna de miel y probamos una pizza como esta en Artichoke Basille's Pizza, soñamos con ella!!! Así que le daré una gran sorpresa!! Enhorabuena por tu blog y muchos besos!! Hola BLANCA de España! Espero que usted y su marido lo disfruten. Gracias por tu comentario! Oh my, this looks delicious! Never would've thought of this on my own, so thanks! I made this last night and it was delish! So nice to have something different for pizza for once! Hey looks great, can you give your recipe for the crust!!! OMG wow! This recipe is delicious! This was great. Made it last night. I added some ground pepper for seasoning and made my own pizza dough. It actually taste better and the cream sauce wasn't as overpowering than the artichoke pizza I had from Artichoke Basille's. This is definitely a keeper. Everyone loved it.